An archaeologist (George Zucco) who has discovered the existence of the ancient winged god Quatzelcoatl tries to prevent anyone — including his daughter (Hope Kramer) — from knowing about its presence, given that it watches over enormous hoards of treasure. This Poverty Row cheapie is perhaps best known as the film that likely inspired Larry Cohen’s Q: The Winged Serpent (1982). Zucco was a reliable B-grade screen villain — playing Moriarty in The Adventures of Sherlock Holmes (1939) and another mad doctor in The Mad Ghoul (1940) — and he’s appropriately maniacal here. 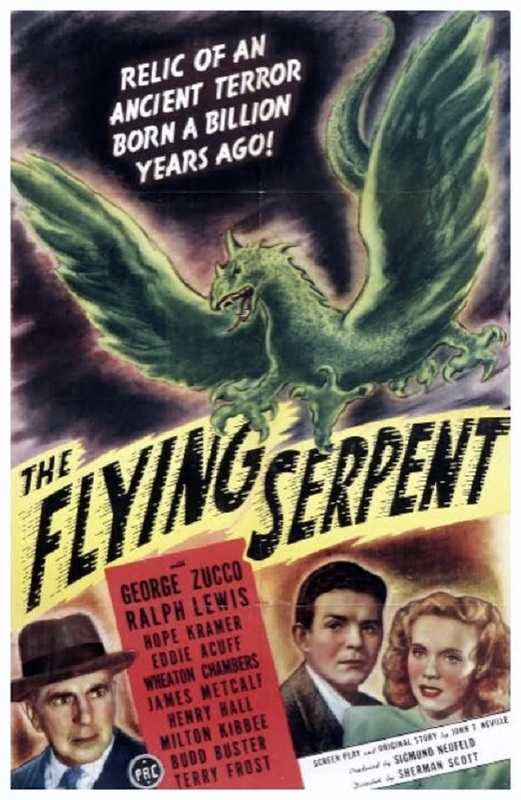 However, the acting overall is tepid; the dialogue laughable; the tiny winged serpent clearly a stringed puppet; and the narrative — involving Zucco’s attempts to knock off various interlopers by strategically leaving one of Quetzalcoatl’s feathers to be discovered, knowing she’ll go insane and kill the holder — is, in a word, silly. The existence of an intrepid radio show host (Ralph Lewis) determined to solve the mystery is novel but unconvincing. At least the whole thing clocks in at under an hour. Not much — though some of the dialogue does elicit a few chuckles. Nope; skip this clunker, by all means. Listed as a Camp Classic in the back of Peary’s book.